Back when Audi was working on reinvigorating its brand image, it focused on three core elements. The first was to build a halo supercar (the R8) that would attract customers into showrooms. Second, was to fit their cars with fancy new LED headlights that set the brand apart from its rivals. And third, was to offer an affordable model in their lineup targeted at millennials in order to secure customer fidelity for years to come–the A3. It has definitely proven itself to be a winning formula. Acura believes it can use the same tactic to secure its position in the luxury car market. Halo supercar? Check – the return of the iconic NSX nameplate is not only a welcome addition to the VIP 1% club, it sets a new benchmark for what we should expect from such vehicles and proves that there is indeed a green future for supercars. Fancy new headlights? Mission accomplished, thanks to the beautiful and cleverly named Jewel Eyes which now come standard on all models across the Acura line. And finally, an entry level vehicle: the ILX. While not yet on par with the iconic Integra we all grew up with and loved, that luxed-up Honda Civic with its very impressive DCT dual-clutch transmission is without fail a step forward in the right direction for Honda’s luxury division. And now, this: the MDX. You see, while Acura was busy rebuilding its brand image, it was selling MDX’s like hotcakes in the background. In fact, the MDX happens to be the best-selling three-row luxury SUV of all time, with sales topping 50 000 units in each of the past three years. That said, Acura believes its big boy SUV deserves an update for 2017. And with the tagline “It’s like wow!” used throughout its marketing campaign, I was curious to see what the hype is all about. 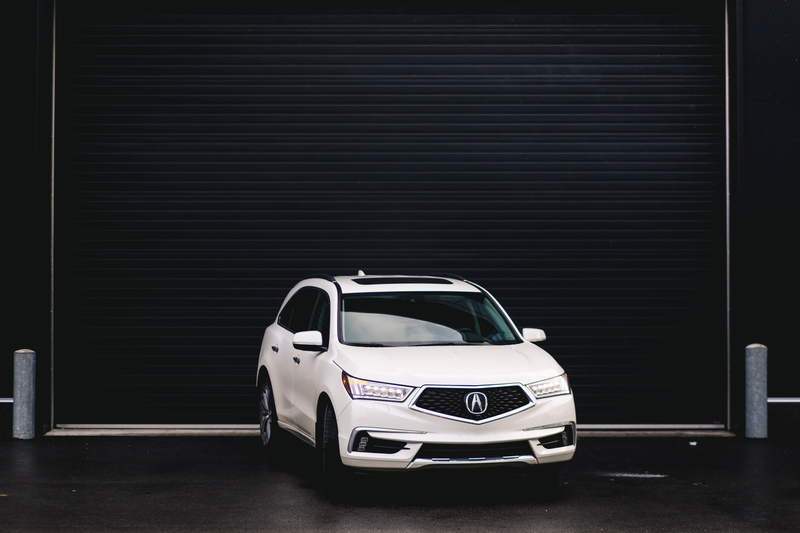 The immediate difference between last year’s MDX and this 2017 model is the remodeled front fascia, which Acura dubs “The new face of Acura”. Not only does it feature a fresh pair of restyled Jewel Eyes, but the controversial chrome shield beak that has become iconic to the Acura brand is now gone. This is a bold move for Acura, since for the longest time it used that beak to enforce its brand identity. 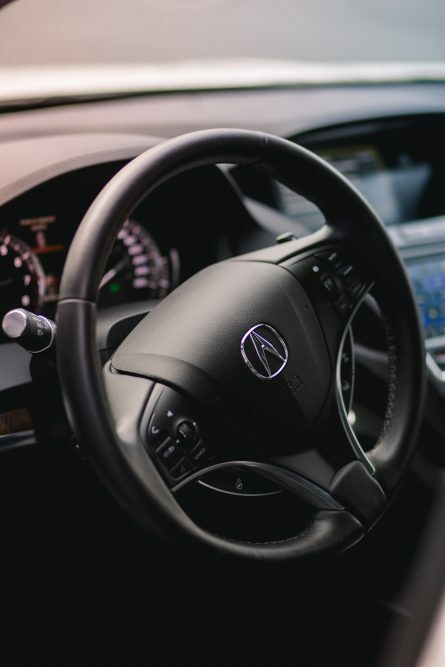 Removing it is not only a sign that even Acura admits it was a bit “too much”, it’s also a sign that the brand has matured and is confident enough to take a whole new styling direction. 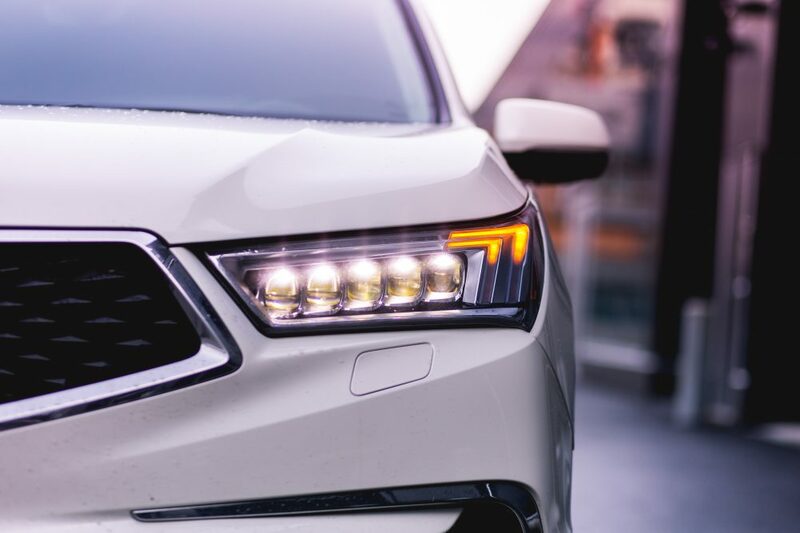 For the MDX, that beak has been replaced by a diamond pentagon grille, inspired from the Acura Precision Concept that was presented at the 2016 North American International Auto Show. And I must say, it gives the 2017 MDX one heck of an attractive maw. The new grille is accentuated by a more sculpted hood, a restyled front bumper, and revised front fenders. 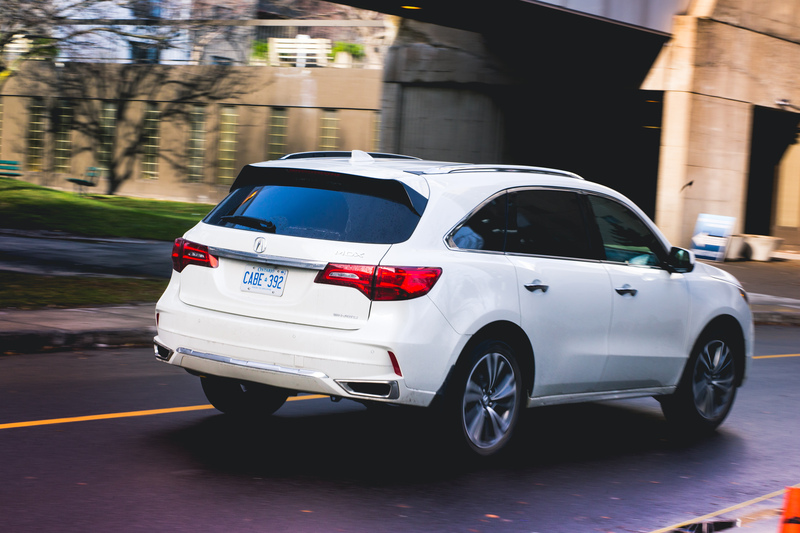 Out back, there’s a more squared off bumper as well, thinner taillights, and, unlike the last MDX which hid its exhaust pipes underneath its bumper, they’re now visible and triangular to further emphasis the MDX’s performance-oriented drivetrain. Overall, this facelifted MDX is absolutely stunning, especially painted in White Diamond Pearl. But then again, when you’ve got a 575 hp hybrid supercar sitting in your showroom, all your cars suddenly need to look exciting. Mechanically, not much has changed for the 2017 MDX, and with good reason. 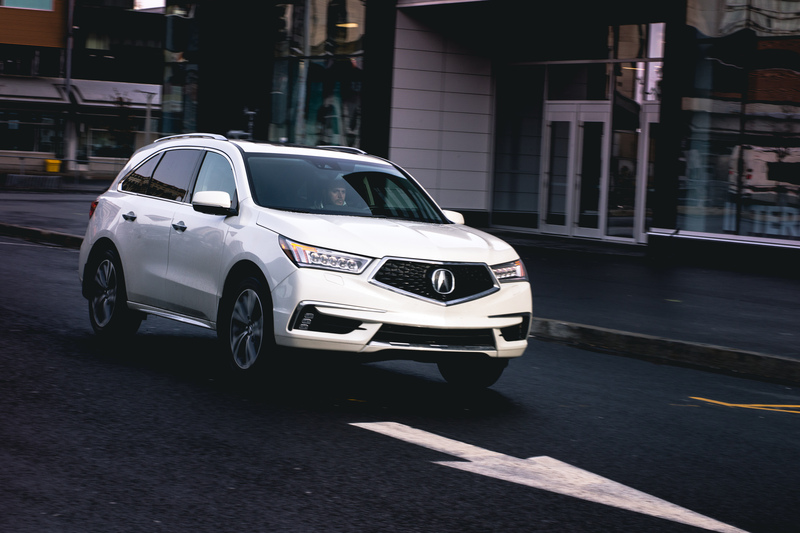 Acura isn’t messing with a winning formula here, and won’t take away the endearing traits that have made the MDX such a huge sales success. Under its hood resides the tried and tested Honda/Acura 3.5L, direct-injection V6 – an engine that I’ve tested both in the TLX sports sedan and Honda Ridgeline Pickup, and one that I’m absolutely in love with due to its naturally aspirated conception, lively character, and willingness to rev all while emitting oh-so-glorious VTEC sounds. 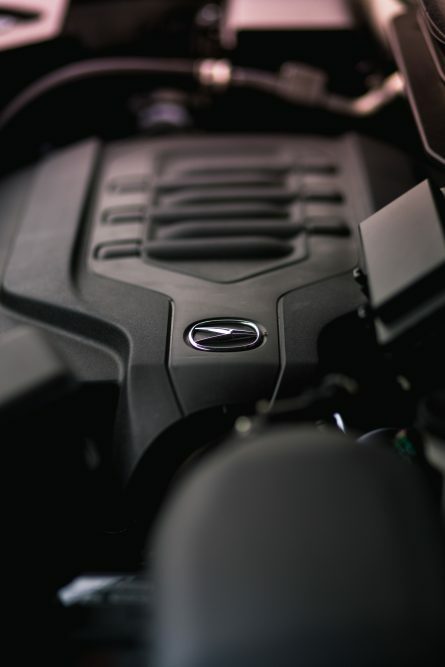 In the MDX, the setup makes 290 hp and 267 lb-ft of torque. First impression is how capable this engine remains even in a 1930 kg 7-passenger utility vehicle. 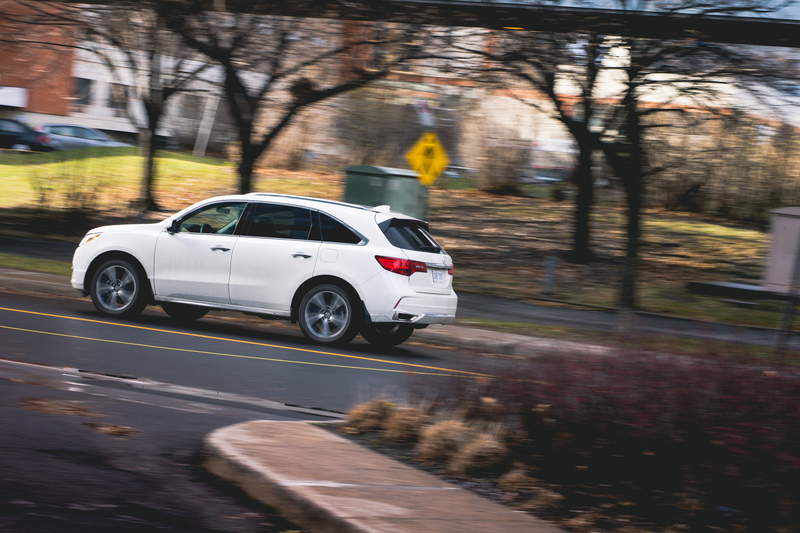 With a 0-100 km/h time a hair under 6 seconds, the MDX is an appropriately quick mofo. 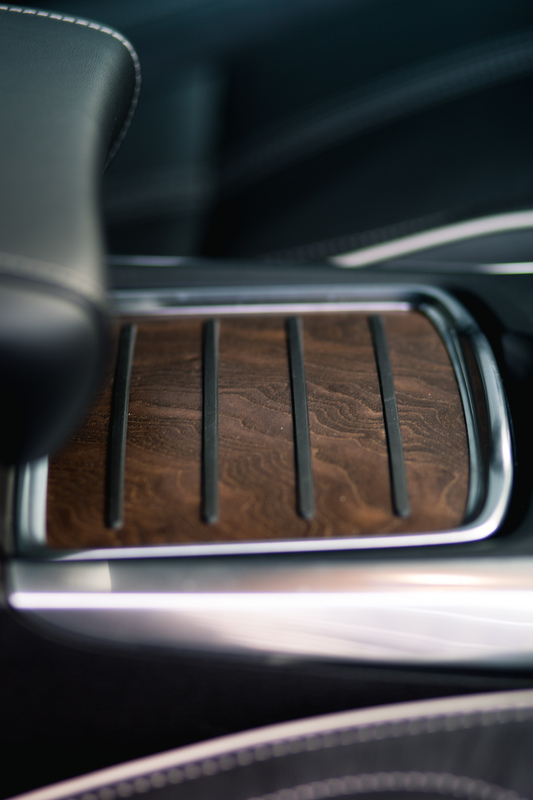 That instant acceleration is partly attributable to the controversial 9-speed ZF-sourced automatic transmission, which, like in the TLX, is equipped with an unintuitive and useless push-button drive selector. This transmission still has no clue what to do when you punch the accelerator and is plagued with frustrating delays before it actually finds the right gear. Where it shines, however, is in its short gearing set up. Due to a 20.4:1 overall ratio, there’s a heck of a lot of shifting going on, allowing this behemoth to storm out of the hole like an NFL linebacker all while torque-clipping its gears during wide-open throttle accelerations. Don’t be fooled folks, this pretty-eyed family hauler sure can bogey, all the while returning a 10 L / 100 km combined fuel consumption average. And it drives amazingly well too. Like the TLX, the MDX is fitted with Acura’s clever torque vectoring SH-AWD system, which continues to impress no matter the road conditions. 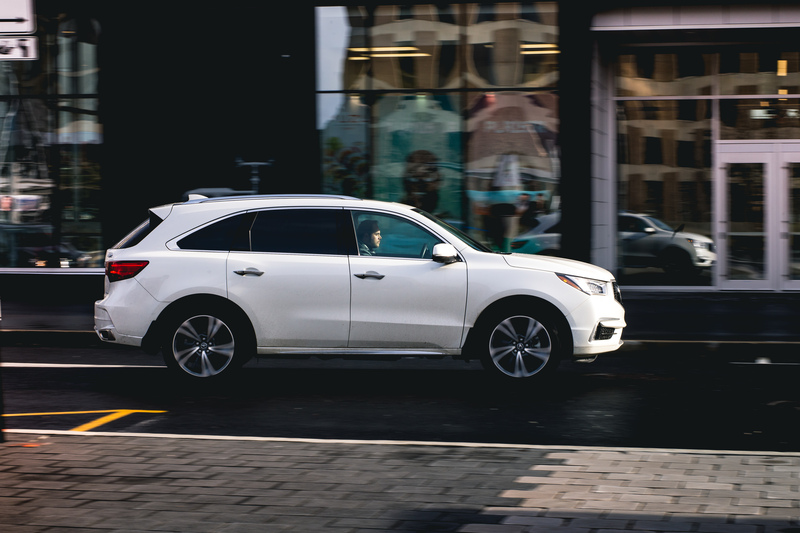 Steering is sharp in the MDX, the chassis is stiff, and the entire vehicle feels light on its feet, nimble, and playful at the limit. Like all Honda products lately, the MDX gracefully balances sporty driving dynamics with everyday usability resulting in a very enjoyable experience behind the wheel. And coming from a guy that usually hates SUV’s, that says a lot. 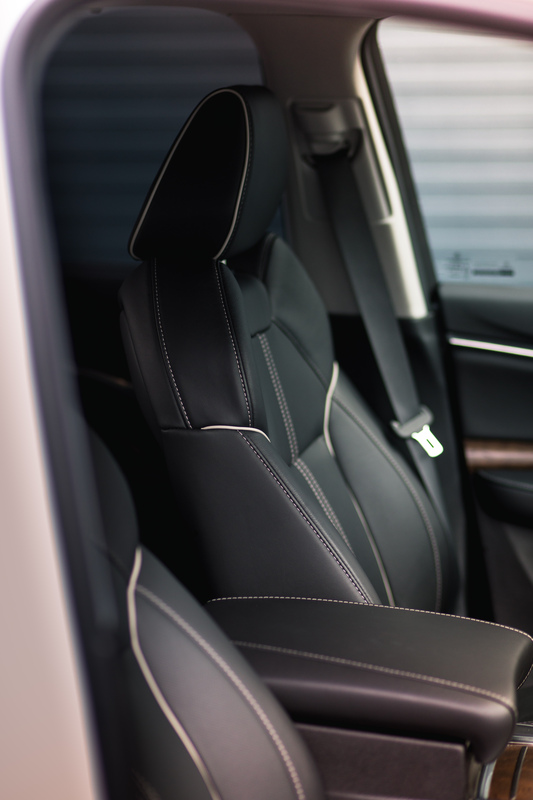 Inside the 2017 Acura MDX, it’s the usual clean, functional and well put together Acura interior. It’s pretty much the same theme as in the TLX and ILX: black on black everything, with subtle chrome accents and brushed aluminum here and there. It looks good, but like in the TLX, it’s business-like, functional, and not what you would call extraordinary. It must be said, Acura remains a champ at fitting its cars with sumptuously comfortable leather seats, and on that front, the MDX doesn’t disappoint. As in all Honda/Acura products, visibility in the MDX is spot on all around and the cabin is spacious, comfortable and filled with cubbies and storage areas to stash your gear. I’m a particular fan of the ginormous centre storage compartment, which, like in the Ridgeline, will engulf anything from full-size water-bottles to a few bags of chips. As usual, Acura’s dual-screen infotainment system remains a burden. 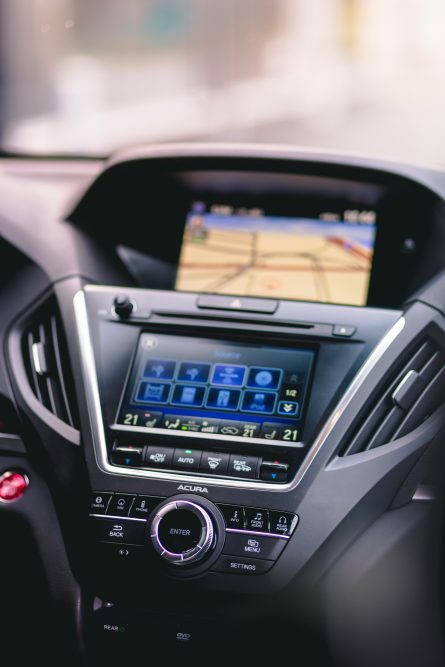 Even after sampling the system in a few of their cars and getting used to it, it remains complicated and unintuitive, where simple controls such as changing a radio station are tedious and distracting. Although I understand the practicality of having two screens for different functions such as navigation on top and music controls on the bottom, the information can be duplicated which makes for a very hard system to comprehend altogether. 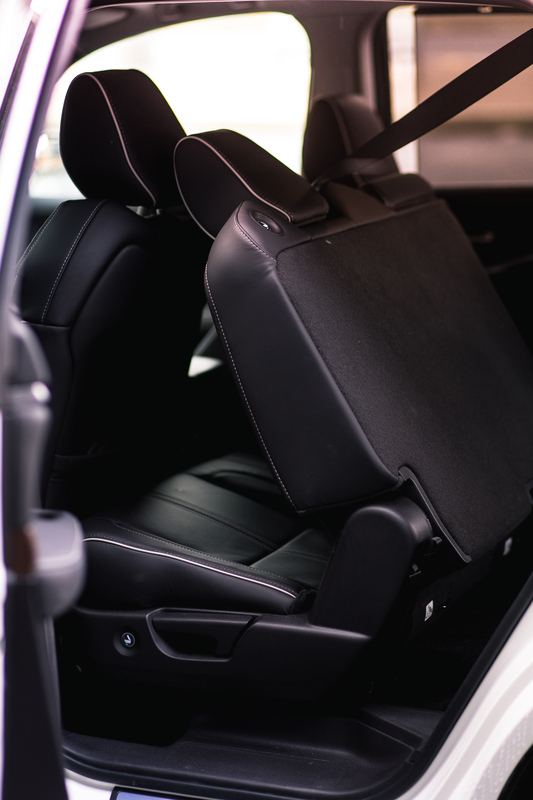 Rear head and legroom remain the MDX’s strong points, with a first row bench that can easily accommodate full-size humans in total comfort, and will instantly move forward at the touch of a conveniently placed button, allowing for a more than acceptable opening, giving way to the third row bench. I sat back there. It’s cramped. But there’s still more room and it’s easier to get in and out of than the Nissan Pathfinder I reviewed a few weeks ago. As for overall cargo space, the MDX boasts traditional Honda packaging ingenuity, with a third row that can be conveniently stowed inside the floor at the pull of a handle. With the third-row seat up, the MDX offers 421 litres of cargo space, which is a tad under what the direct competition, the Volvo XC90 and the Infiniti QX60, offer at 453 litres respectively. Other gripes with the MDX are its idle stop feature (engine shuts off at a stop light to save fuel) which was inconsistent by automatically turning itself off and back on. Also, when the V6 abruptly comes back to life there’s an unpleasing and unrefined vibration felt throughout the entire cabin. The Volvo’s system was much smoother. Finally, there’s the level of technology offered standard in the MDX that remains very impressive. Acura Watch is now standard in all trim levels, and offers a full battalion of semi-autonomous gear and safety gizmos such as adaptive cruise control, lane watch monitoring, a collision mitigation system with automatic braking, pedestrian detection, cross-traffic monitoring, and a 360-degree camera system that allows you to see everything going on around your ever-so-precious Emdeehex. 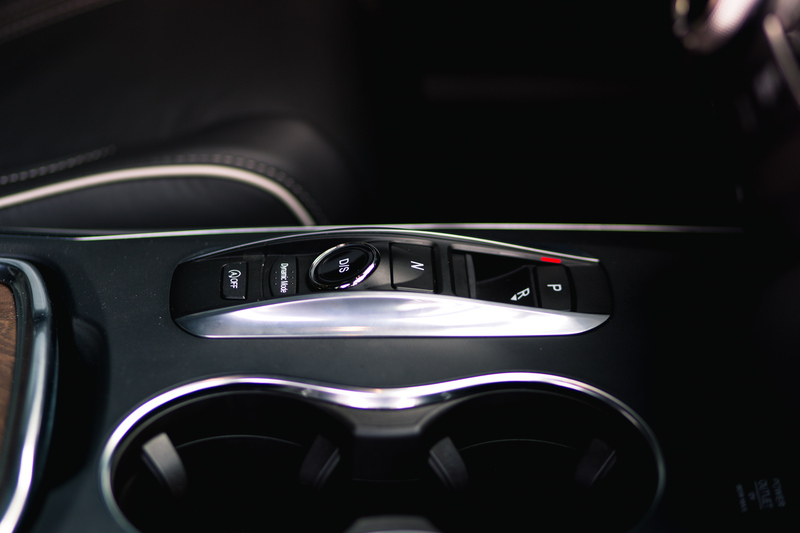 And while all these systems are fine and dandy, they add a level of complexity to the vehicle that can become quite dizzying after spending some time in it. Luckily, all systems can be turned off, but since they’re always turned on by default every time you start the vehicle, you’ll have to spend an entire minute deactivating all the toys – kind of like when a jet pilot is ready to take off, but the other way around. Pricing for the 2017 Acura MDX starts at $53 690 and tops out at $65 790 for an Elite model such as my tester. This puts the MDX at a pricing advantage against its European rivals, especially the Volvo XC90, while offering a lot more SUV for the money. The MDX’s Elite trim level is the icing on the cake and comes with added luxury features such as that 360-degree camera I mentioned above, a DTS, Dolby Pro Logic II, 12 speakers sound system with integrated rear subwoofer and a DVD ultrawide rear entertainment system with 16.2-inch display and HDMI input jack. That one comes with a pair of wireless headphones that automatically turn off the moment they’re positioned past the front seats for safety purposes. 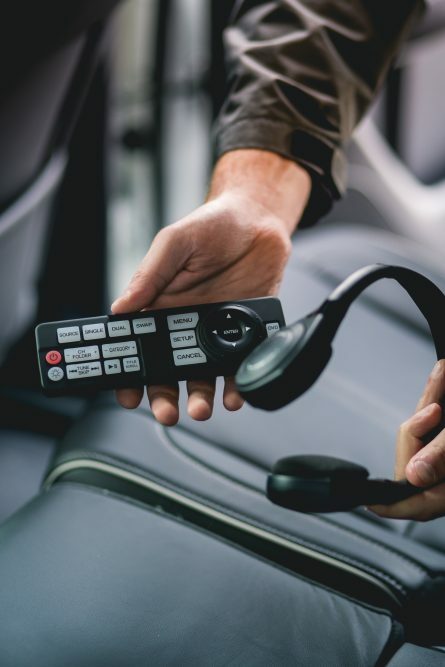 A 6-passenger MDX Elite is also available at no extra cost, offering two sets of captain chairs out back with integrated centre consoles. If you want my honest opinion, the 2017 Acura MDX remains a no brainer. As far as 7-passenger luxury SUVs go, it simply presses all the right buttons. It may not be as refined, sophisticated and revolutionary as the Volvo XC90, but Acura has given their big guy enough goodies to make it a compelling proposition in the segment. 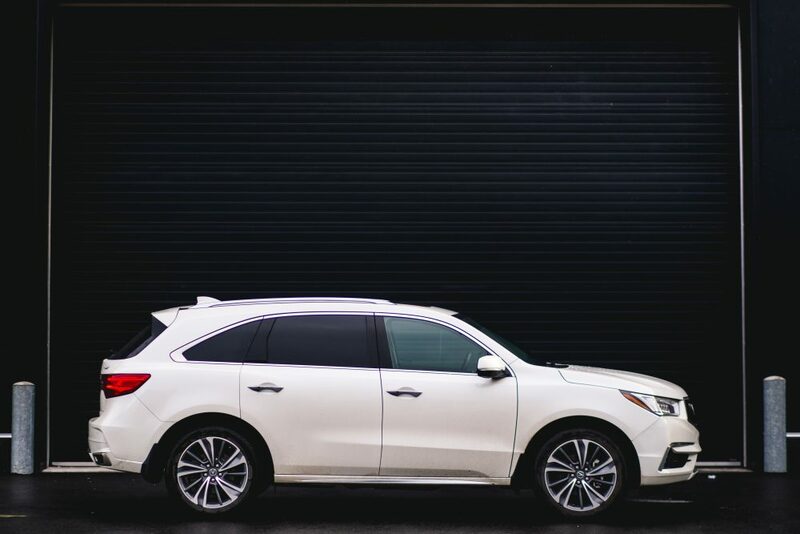 Above all, it’s the MDX’s fundamentally spirited handling, ample power, and fun-to-drive character that are definitely, Like Wow! + Spirited handling and fun to drive. + Much improved exterior styling. – Complicated and laggy 9-speed automatic transmission. – Unintuitive dual-screen infotainment system.